Villa Lomas est une belle escapade romantique niché dans les collines luxuriantes de Rincon, entouré par des vues imprenables sur les eaux turquoises de la mer des Caraïbes. Cette villa vous offre un appartement luxueux, qui dispose de deux chambres et deux salles de bains, idéal pour deux ou quatre chambres à l'époque, ne convient pas pour les enfants. Nos vacances appartement / villa, a une cuisine, des lits queen size dans chaque chambre, des draps fins et des serviettes de plage entièrement équipée, satellite TV- CD-DVD, accès Internet, d'une terrasse spacieuse meublée, barbecue, une laverie et un espace de stationnement dans la Villa . Ces logements sont pour les voyageurs en quête d'élégance, d'intimité et de beauté tropicale. La villa est située au milieu de 3 acres gated de jardins tropicaux luxuriants, à quelques minutes à l'étape Beach, une des plages les plus célèbres à Rincon pour la plongée et les bains de soleil. Venez nager dans la piscine méditerranéenne de l'eau salée, ou tout simplement se détendre sous le chaud soleil de l'île des Caraïbes de Puerto Rico. The apartment was well appointed and artistically decorated. It was so comfortable we barely wanted to leave. The pool is lovely. The gardens were beautiful in spite of the horrible drought. However, the best part was the hospitality. We were tired when we arrived and Alvaro and Bruce took great care of us. We really enjoyed our conversations with them and the great advice they provided about Rincon. We look forward to staying again and visiting our new friends. Thank Judy you for your great review, and the most important thing is that we got to know you and William, our new friends too. 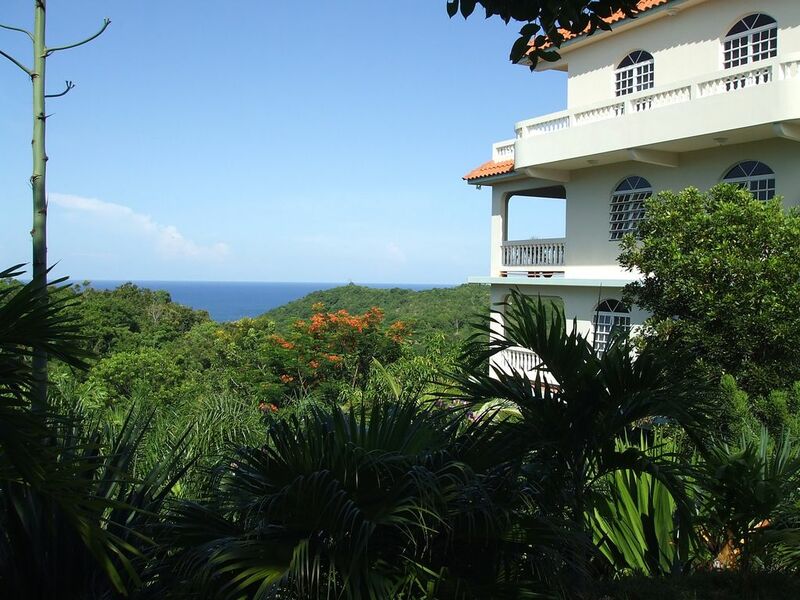 Vacationing in this private villa in Rincon is truly an unforgettable experience. The owners, Alvaro and Bruce, take incredible pride in their property and it shows in every detail. Villa Lomas is absolutely lovely - spacious, very clean, beautifully decorated, comfortable, and quiet. We have been home for a week and miss our time there very much. Every part of this vacation experience went smoothly - from the reservation to the check out. The villa is situated high on a hill, less than a miles drive to Steps Beach - a beautiful beach to relax on and go snorkling. It is also a short drive to all of the restaurants and downtown Rincon. The English Rose (Breakfast/brunch) is a 5 minute walk down the hill. The view from the villa is gorgeous. We exercised and ate breakfast on the large terrace every day. We also enjoyed the private pool that is surrounded by beautiful, tropical gardens. I can't say enough about this property and the owners. It was everything we were looking for and more. Thank you Alvaro and Bruce for opening your home to us!! We hope to see you again. Perfect Villas with spectacular views! Staying at Villa Lomas was wonderful. At arrival we were greeted by Alvaro and Bruce. They were very knowledgeable of the area and great host. We rented both villas since we were two couples. Both villas were impeccable, they had private comfortable bathrooms and spacious accommodations. One of the villas had a full kitchen with eating area. Both villas had doors adjacent to a magnificent wide and open balcony. The views of the ocean and sunsets were spectacular. The property it self if gorgeous. We took a tour with Alvaro of his beautiful garden. The pictures do not do this property justice. The villas are located just a few minutes from the English Rose, Steps beach and Road 413 which is one of the main roads to everything, so that was very convenient. Steps beach is one of the most sough after snorkeling beaches in Rincon. We go to Rincon often and I have to say this has been one of the most comfortable, peaceful and beautiful places we have ever stayed at. We would highly recommend staying at this property. we are please to offer to all our guest the attention that will make their vacation enjoyable. A Truly Wonderful Place to Stay! Everything about our stay was wonderful from the prompt emails booking our stay until the gate closing as we left for the last time. Alvaro and Bruce guided us in to their amazing property over the phone. Our room was spacious, charming, very clean and we had the most gorgeous view! Comfortable bed with nice linens. More than adequately stocked kitchen. Bruce's fantastic paintings as well as an assortment of their extensive art collection just made the place seem refreshingly outside of the box. The pool is one of the prettiest and most serene pools I have ever had the pleasure of hanging out at - every bit as private as our room. Alvaro (and Bruce) gave us the most incredible guided tour of their gardens. Steps Beach is just down the hill. The use of a washer and dryer was a nice surprise as well as beach chairs. Thank you very much for your sincere review, it was a pleasure in meting you both, and we are very glad that you enjoy your stay, we are looking forward to seeing you int the near future. Please keep in touch with us. Again, it was wonderful to know you both. Where to begin? Arrival would be a wonderful place to start. We were expertly guided into this private gated villa by both owners. While I was on the phone with Bruce, Alvaro was patiently waiting at the gate in the rain. We stopped our car in front of a beautiful courtyard where they both help us unload and welcomed us with a wine toast and tour of the apartment. It did not feel like an apartment. It was so private and spacious and conducive to outdoor life. The gardens at this Villa are magnificent and each plant was lovingly chosen and planted by the owner. Three acres of lush tropical paradise. While the days were busy with visiting various beaches, snorkel beach, swimming beach, surf beaches, sea glass hunt beaches, so many beaches, all from a three minute drive to a 40 minute drive. By night, many restaurants, beach bars, anything you want or just stay at home and cook and relax on the lovely veranda and listen to the variety of birds which also make magnificent sounds for sleeping. The apartment is well equipped for cooking and there is a farmers market on Sunday in town and a supermarket within a 5 minute drive. The best breakfast place in town is a very brief walk just outside your gate with a magnificent view of the ocean. The villa is decorated with the beautiful artwork of one of the owners. They are most gracious hosts who leave you to your privacy, yet willing to answer any questions at anytime. Please do not hesitate to trust the the reservation process. Alvaro has it down to a science and the procedures are a little different than most. The PO Box mailing address is necessary as there is no mail delivery up the hill. It is for your safety as well as his, that a check be mailed in advance. Alvaro likes to speaks to his intended guests and I, too, felt better after having a conversation with him and his co-owner. I cannot say enough about the owners. They were delightful, engaging, interesting and wonderful to work with. I don't want to sell this place too well, because I want to keep my spot open to return. You cannot go wrong with this choice! Missing Rincon and our little piece of paradise already. My wife and I truely enjoyed our stay in La Casa Loma. Very nice veranda .We cooked some of our meals there which was fun.The pool is private and peaceful.Abundant flora and wildlife. We always felt very secure knowing and enjoying the home owner hospitality. rates $150 per night in the fall Rates $135.00 $190.00 Applicable rates subject on number of people Special weekly rates available. Just call or e-mail.